I love a good romance. Heck, I like a decent romance. Unfortunately, this was more like watching the writer play “Barbies” than actually reading a romance. The entire novel could’ve been condensed into a short story. There wasn’t enough plot to hold up a full length novel, so the author substituted melodrama, lots of running away, and contrived situations to get the page count. In a desperate attempt to have enough food and burning fuel to get through the winter, Anne makes a wish for a handsome husband that will provide for her and her sisters. Low and behold, shortly after making the wish, the rich hero arrives and starts paying all sorts of attention to her. Let’s state again the heroine and her sisters are on the brink of not having enough food or fuel to get through the winter. We’re talking about starvation or a life of prostitution to survive. 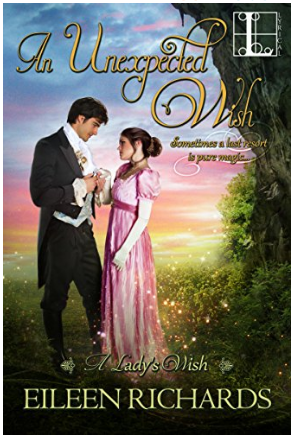 But the heroine decides she can’t possible marry the hero because he loves her only because of her wish. Let me tell you, if I became a New York Times best-selling author because of a wish, I’d take it with both hands and never look back. What makes this even more disingenuous is that the heroine had no problem marrying her younger sister off to “save the family”. Frankly, the story should’ve ended with the handsome hero offering for her, and Anne saving the family. If the author wanted a full length novel, she needed something more to keep the hero and heroine apart. The “oh, he couldn’t possibly love me for real because of I made a wish” held absolutely no water. Let me tell you how much I disliked the heroine after hearing this a dozen or so times, and there were several dozen more times of listening to her say it still to come. I mean, seriously. This is what she wanted, what she needed, to keep her sisters from starving. To keep them freezing come winter. And to reject it because of superstition? Most hungry people would marry him and thank the fairies, not throw their “wish” back in the fairies’ face. Now, enter deadbeat brother who has lost the entire family fortune to gambling (with the hero, nonetheless) and is looking for his sister to part with her mother’s jewels to save him from some very relentless creditors. And, he’s told every hoodlum in London that his sister has these jewels. Of course, there are no jewels or Anne would’ve sold them already. You can guess where this is going. The brother must be redeemed, but the path to his redemption is unbelievable. One minute he’s willing to sell his sister to the hero for his “get out of debt” free card, and the next minute he’s suddenly willing to go to India and work off his debt to the hero. Nothing I saw created that change. Just sorta, yep, we need a happily-ever-after ending, so he’s gotta change. Not even the “twist” ending was believable. Why would Cecil Worth bother with the whole use of the Fairy Steps in the first place to trick Anne into thinking she was getting a wish? Anne had no suitors. If he was suddenly interested in her because of the jewels, he had no need to go through with the ruse. Never explained, and makes no sense given his character. But, you know, the plot needed a villain and a plausible explanation for the wish. Speaking of plot, it mostly consisted of lots of running from here to there for the heroine as she goes from dodging one suitor to another. Seriously. Let’s run away to the Lodge. oh no, hero is there. Let’s run back home. Oh no, brother is there. Let’s go for a walk in the woods. Oh no, other suitor is there. Ugh. I think fifty percent of the book was the heroine running around for “reasons”. There’s the obligatory steamy scenes towards the end, but they’re as cardboard and unbelievable as the rest of the story. Oh yeah, then there was my least favorite romance trope. The heroine being kidnapped. And because its snowing, her captor totally doesn’t give chase when she slips into the forest after getting motion sick. But, you know, the hero is totally just going to pay a ransom when he can find her footprints in the snow. *eye roll* The author must’ve been getting to the end of word count and didn’t want to spend much time on this. All in, I walked into this book looking for a bit of pleasure reading. Some book candy while my kids watched a movie on Friday night. I wanted a fun romance, maybe some good steamy scenes, and a happily-ever-after. I got the HEA, but that was about it.